Jacquy Pfeiffer: [describing a large, thin eggshell made of sugar crystal] I just need one. But I'm going to make nine, in case I break eight. I just saw Kings of Pastry with a very emotive audience at the Brooklyn Museum, where the two directors were in attendance to answer a few questions. When asked about the production, Hegedus let slip that this was basically a "home movie" due to time and money constraints. She did nearly all of the shooting herself, with the help of apparently no one except that eccentric Pennebaker, and frankly it shows. Unflattering angles, odd compositions, bad lighting, and dirty lenses all give the video a very, shall we say, authentic look. But we are able to look past all that since the subject is so interesting, and the tension is real. Though the video focuses on a French-born contestant living in Chicago, two other pastry chefs allowed their precious preparation time to be intruded upon by Pennebaker's camera. Of the three, Philippe Rigollot (which sounds like Philippe Funny in French!) was definitely the most absorbing. When he was a teenager, "school was a bit difficult... so I decided to be a pastry maker." One detail you might miss if you don't understand French is that many of these men who end up building $50,000 cakes for presidents didn't graduate high school. Many of these guys have been doing nothing but perfecting their trade since the age of 16. Their somewhat rough, unrefined manners contrasted with the daintiness of their product elicited a few guffaws (only among the francophones in the room). Even the head judge of the pastry Meilleurs Ouvriers de France had a distinctly "low class" accent. 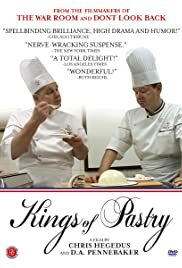 Even though the title is Kings of Pastry, you might not even notice that you've seen much "pastry" per se. Most of the time is spent on the extravagant chocolate and candy sculptures that serve as a centerpiece. Since these delicate works of pop art are made almost entirely of sugar, a lot of the interest of the movie becomes seeing how successfully they transport these highly breakable objects from one room to another. Which brings me back to my initial complaint about the production value. You can tell that these works of art are stunning, but the low lighting etc. results in crappy video that does not do justice to the work of these master chefs. These are some of the best chefs in the world, and the directors went all "Timmy's B-Day, 1996" on their asses.